Dublin City Council as part of its ‘Smart Docklands’ project and in partnership with the Civic Group will bring a glimpse of the future of smart and sustainable transport to Dublin. The Easymile ‘EZ10’ is a driverless, electric shuttle bus, which can carry up to 15 people. Later this month EZ10 will make its Dublin debut as part of Dublin City Council’ European Mobility Week event. The EZ10 features a built-in access ramp for passengers with reduced mobility and there is no need for additional road infrastructure to operate the vehicle. 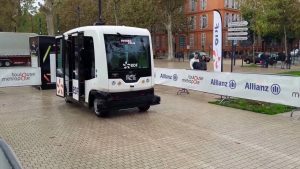 The vehicle has ‘state of the art’ smart technologies with advanced cameras, processors and sensors that enable the trip to run smoothly. The ‘EZ10’ is currently in daily operation at locations in the US, Holland, China and Estonia and is expanding globally. The event will be open to the public as part of Dublin City Council’s ‘Future Mobility Showcase’ on North Wall Quay on Saturday September 22nd from 11am to 5pm where there will be on street family friendly activities. The shuttle route will run for nearly one kilometre with 4 stops in place from the Dublin Convention Centre to the 3 Arena. There will be an opportunity to take a free trip on the shuttle from 2pm to 5pm on Friday September 21st and 11am to 5pm on Saturday September 22nd. There will also be a showcase of new transport services such as shared bikes, e-bikes, electric scooters and car clubs. In particular cycling will play a key role in the future of transport with the City Council hosting the global cycling conference VeloCity in 2019 at the Convention Centre Dublin, which is the location of the first stop on the EZ10 route.